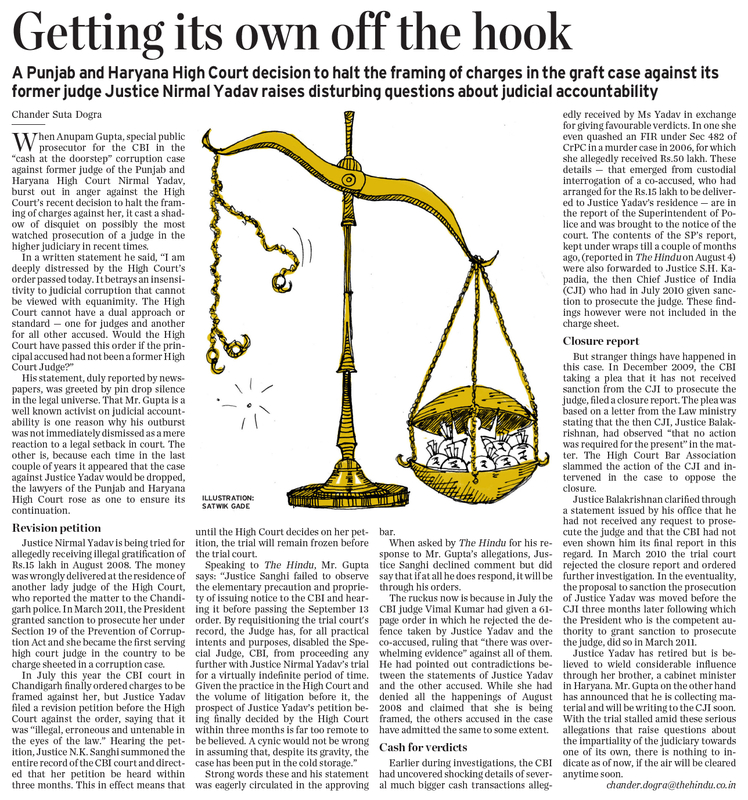 When Anupam Gupta, special public prosecutor for the CBI in the “cash at the doorstep” corruption case against former judge of the Punjab and Haryana High Court Nirmal Yadav, burst out in anger against the High Court’s recent decision to halt the framing of charges against her, it cast a shadow of disquiet on possibly the most watched prosecution of a judge in the higher judiciary in recent times. His statement, duly reported by newspapers, was greeted by pin drop silence in the legal universe. That Mr. Gupta is a well known activist on judicial accountability is one reason why his outburst was not immediately dismissed as a mere reaction to a legal setback in court. The other is, because each time in the last couple of years it appeared that the case against Justice Yadav would be dropped, the lawyers of the Punjab and Haryana High Court rose as one to ensure its continuation. 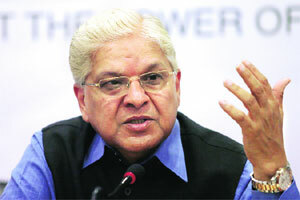 Justice Nirmal Yadav is being tried for allegedly receiving illegal gratification of Rs.15 lakh in August 2008. The money was wrongly delivered at the residence of another lady judge of the High Court, who reported the matter to the Chandigarh police. In March 2011, the President granted sanction to prosecute her under Section 19 of the Prevention of Corruption Act and she became the first serving high court judge in the country to be charge sheeted in a corruption case. In July this year the CBI court in Chandigarh finally ordered charges to be framed against her, but Justice Yadav filed a revision petition before the High Court against the order, saying that it was “illegal, erroneous and untenable in the eyes of the law.” Hearing the petition, Justice N.K. Sanghi summoned the entire record of the CBI court and directed that her petition be heard within three months. This in effect means that until the High Court decides on her petition, the trial will remain frozen before the trial court. Strong words these and his statement was eagerly circulated in the approving bar. When asked by The Hindu for his response to Mr. Gupta’s allegations, Justice Sanghi declined comment but did say that if at all he does respond, it will be through his orders. The ruckus now is because in July the CBI judge Vimal Kumar had given a 61-page order in which he rejected the defence taken by Justice Yadav and the co-accused, ruling that “there was overwhelming evidence” against all of them. He had pointed out contradictions between the statements of Justice Yadav and the other accused. While she had denied all the happenings of August 2008 and claimed that she is being framed, the others accused in the case have admitted the same to some extent. Earlier during investigations, the CBI had uncovered shocking details of several much bigger cash transactions allegedly received by Ms Yadav in exchange for giving favourable verdicts. In one she even quashed an FIR under Sec 482 of CrPC in a murder case in 2006, for which she allegedly received Rs.50 lakh. These details — that emerged from custodial interrogation of a co-accused, who had arranged for the Rs.15 lakh to be delivered to Justice Yadav’s residence — are in the report of the Superintendent of Police and was brought to the notice of the court. The contents of the SP’s report, kept under wraps till a couple of months ago, (reported in The Hindu on August 4) were also forwarded to Justice S.H. 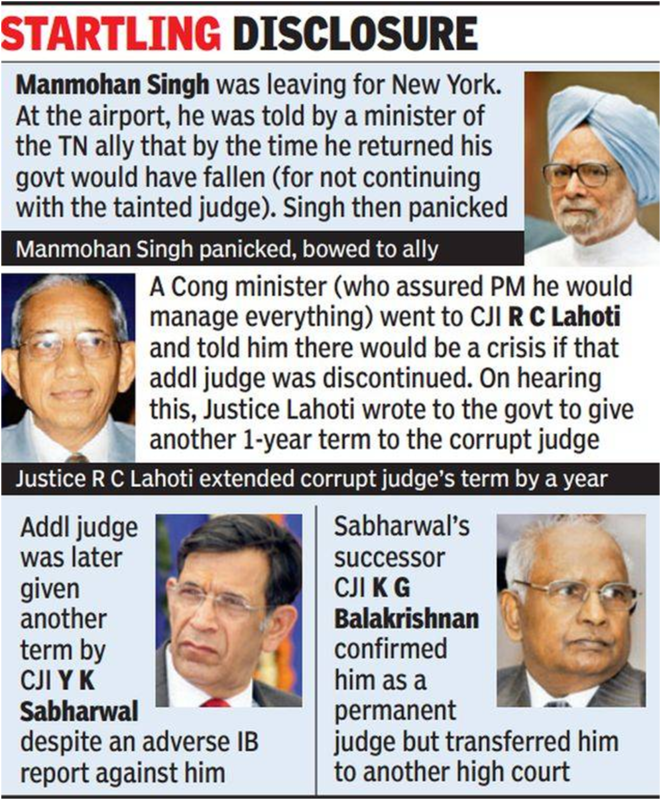 Kapadia, the then Chief Justice of India (CJI) who had in July 2010 given sanction to prosecute the judge. These findings however were not included in the charge sheet. But stranger things have happened in this case. In December 2009, the CBI taking a plea that it has not received sanction from the CJI to prosecute the judge, filed a closure report. The plea was based on a letter from the Law ministry stating that the then CJI, Justice Balakrishnan, had observed “that no action was required for the present” in the matter. 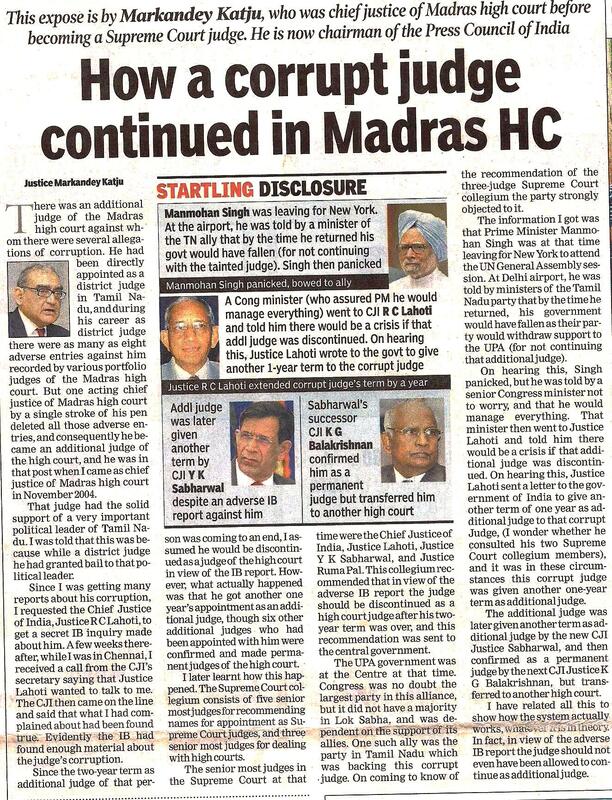 The High Court Bar Association slammed the action of the CJI and intervened in the case to oppose the closure. Justice Balakrishnan clarified through a statement issued by his office that he had not received any request to prosecute the judge and that the CBI had not even shown him its final report in this regard. In March 2010 the trial court rejected the closure report and ordered further investigation. In the eventuality, the proposal to sanction the prosecution of Justice Yadav was moved before the CJI three months later following which the President who is the competent authority to grant sanction to prosecute the judge, did so in March 2011. Justice Yadav has retired but is believed to wield considerable influence through her brother, a cabinet minister in Haryana. Mr. Gupta on the other hand has announced that he is collecting material and will be writing to the CJI soon. With the trial stalled amid these serious allegations that raise questions about the impartiality of the judiciary towards one of its own, there is nothing to indicate as of now, if the air will be cleared anytime soon. Comptroller and auditor general Vinod Rai recently set the political arena ablaze by saying that he was appalled by the brazenness of government decisions. He did not elaborate which were those decisions, when were they taken and their effect on the people, country and its economy. Before and during the Emergency, government decisions were inscrutable. They were taken as inviolable diktat because of the rasping repercussions it entailed to those bravehearts who opposed them publicly. This mindset allowed the political class to be brazen about decisions.Post-Emergency, public scrutiny of government decisions gained currency but brazenness seldom exited the power corridors. A rag-tag political coalition in Janata Party came to power in 1977 mainly because its leaders served jail terms for raising their voice against excesses on people, But, could it prove anything against those who brazenly perpetrated the excesses on people? 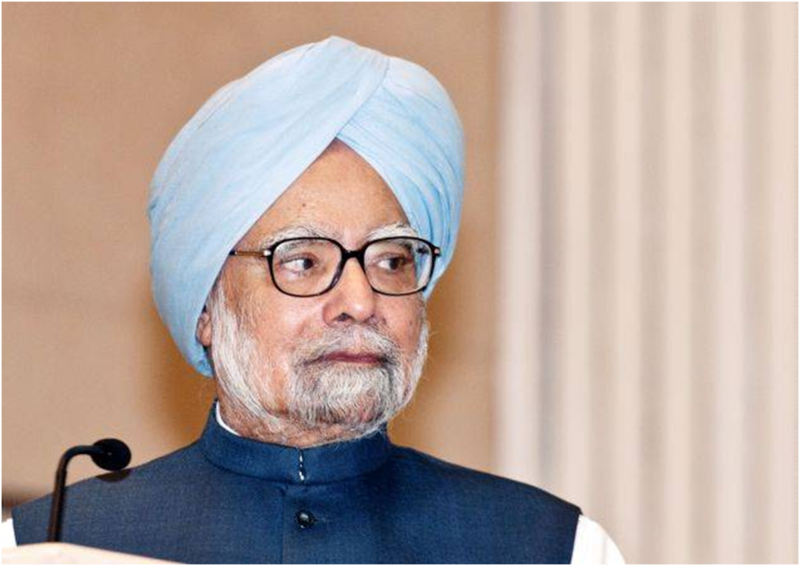 A prime minister was assassinated by her Sikh bodyguards. What followed was brazen and brutal mass murder of Sikhs on the streets of the national capital and other parts of the country. Thousands were slaughtered in cold blood leaving permanent scars on the entire community. After nearly three decades, the question remains: Who got punished for that brazen mayhem? 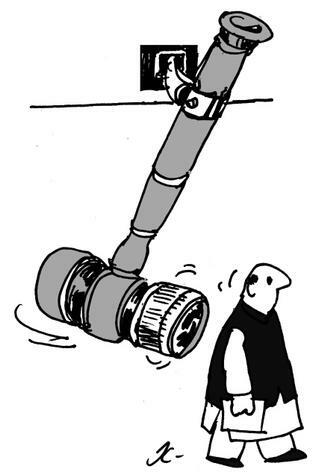 Bofors scam was a political game-changer. On the plank of honesty and transparency, certain politicians toppled the ruling party but failed to prove anything for the next two decades about the brazenness in which bribes were paid in procuring one of the finest field guns for Indian Army. The CBI in its charge sheet gave details of what was going on then at 7, Race Course Road but could prove nothing during the trial, inviting judicial wrath. In 1993, those at the helm of a minority government brazenly bribed MPs to secure their votes on the floor of the House during a trust vote. The long arm of the law cast a shadow close to the then prime minister, but in the end did not touch him. The other conspirators also escaped. In the 21st century, the MPs fell back on an old method – taking money for asking questions on the floor of the House. The disqualification of a MP in the 1950s was no deterrent. As many as 11 MPs faced disqualification for their brazen “cash-for-query” professionalism, throwing parliamentary decorum and their responsibilities and duties as representatives of people to the wind.If these were political brazenness coupled with complicity from the bureaucracy and investigating agencies, there were instances of brazenness in other spheres of governance.The law allowed the government to acquire land for public purposes to build infrastructure, institutions and industries. But the ‘public purpose” clause has been brazenly invoked by authorities to acquire precious fertile agricultural land only to be re-categorized and transferred to realtors for personal gain, turning a blind eye to the plight of the poor farmers and also to its ill-effects on food grain production. Poverty and backwardness continues to haunt a large section of Indian society even 65 years after independence from colonial rule. Instead of laying out a proper strategy to alleviate poverty, the Planning Commission brazenly mocked at the poor by fixing the poverty line at Rs 32 per day. If you earn Rs 33 a day, then you are not poor! If one wants an example of brazenness in spending public funds to achieve zero result, then one need not look further than the Yamuna river. More than 18 years ago, the Supreme Court took over monitoring of steps taken by governments to make the river water potable. After three governments – Delhi, Uttar Pradesh and Haryana -spent more than Rs 5,000 crore in the last two decades, the Central Pollution Control Board (CPCB) gave its verdict: Yamuna is a drain with not a single drop of fresh water as long as it flows in its 22 km stretch in Delhi. These are only a few of the appallingly brazen decisions and actions of the governments in the last couple of decades. This could be the reason why people in recent times have started leveling allegations brazenly against the political class. They have waited in vain for decades hoping against hope that the political class would fulfill the basic promise “we the people” made to ourselves – “Justice, social, economic and political”. Why has the political class or the governments failed to ensure justice to people despite they empowering their representatives with every power under the Constitution? The Bhupinder Singh Hooda government in Haryana hired these top lawyers after it was faced with the prospect of being reduced to a minority in the assembly, following a Punjab and Haryana high court verdict in December last year, detaching the five MLAs from the assembly. The MLAs had joined Congress after defecting from HJC, led by Bhajan Lal’s son and Hisar MP Kuldeep Bishnoi. While Rohinton, son of eminent jurist Fali S Nariman, is the solicitor general of India, Vahanvati is the attorney general of India. The bill is likely to rise with other legal eagles, like former solicitor general Gopal Subramanium and senior advocates Rajiv Atma Ram and Mohan Jain, yet to send their details for appearing in the high court. Information received through the RTI Act by TOI has revealed that the highest billed amount has touched Rs 7 lakh for a single appearance, while the highest amount to be paid to their clerks has touched Rs 1.65 lakh for one appearance along with the lawyers. The lawyers were hired to defend the Haryana Speaker.